Nupoint’s Remote Connect compact satellite data transceiver terminal provides cost-effective and reliable M2M communication to monitor, track, and control assets (fixed or mobile) in isolated locations outside of cellular coverage. Remote Connect—satellite data transceiver combines an advanced processing platform, satellite modem, and integrated antennas to reliably meet your monitoring needs. 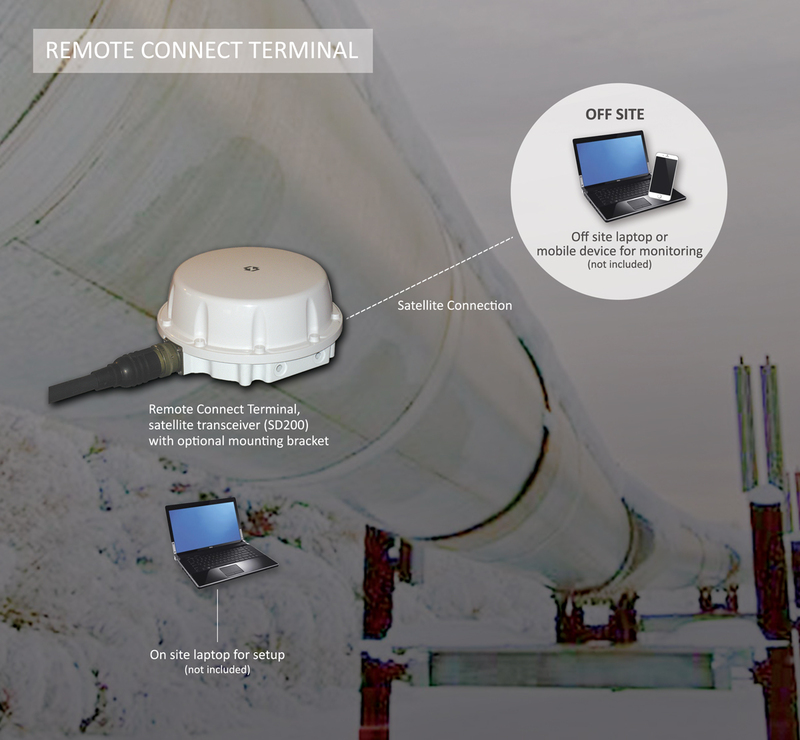 The Remote Connect terminal connects your remote scientific instruments—such as data loggers, environmental sensors (weather, snow, or water level sensor)—computers, cameras, and more via a satellite network to you and your team. Remote Connect satellite transceiver is IP based and supports a direct Ethernet interface to the internet. A RS 232 serial port provides a number of communication protocols from a simple TCP/ UDP/IP translation to a complete PPP interface. More sophisticated custom interfacing can also be accommodated using the built-in scripting capabilities. The communication interfaces available connects most off the shelf Remote Terminal Units (RTU) with your back-end server. The Remote Connect is optimized to respond quickly while minimizing both power consumption and remote site resources. The Remote Connect has a number of built-in applications covering a wide variety of typical communication needs. The unit is easy to program via scripts run on the Remote Connect. The scripts are simple TXT files downloaded to a local file system. The files can be downloaded either locally or remotely over the air. Remote Connect is available in three IO configuration options. Remote Connect has been successfully integrated with weather stations (Luft and Davies), any IP-based cameras, and Reconyx cameras. We can integrate and test the Remote Connect satellite transceiver with your pre-configured intelligent instrument on our premises to ensure it executes its commands flawlessly. When tested to our satisfaction, we ship the fully configured system ready for installation. Contact us for more information.